It's almost February, can you believe it? 2019 is already moving so fast, but I have to say I'm excited about it. I have so many things happening in the next couple months that I'm looking forward to including my move to Dallas and some trips in the summer. For now though, let's focus on the next big thing...Valentine's Day! The holiday is coming up in just over two weeks and although I'm (still) single it doesn't mean I can't enjoy the day. The day is about all sorts of love and I enjoy spending time with my friends and family, it's also a great excuse to wear my favorite color - pink! 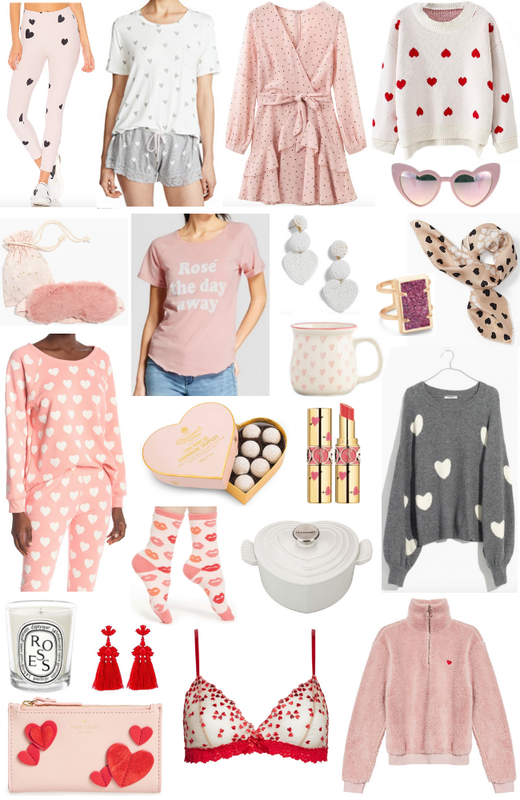 I've rounded up some of my favorite Valentine's Day themed accessories, clothes, and gifts for today's post to get everyone in the mood for the holiday. As you can see, most of the clothes I picked out are comfortable pjs and the like because that's how I'll be spending my day! Plus, you can never have enough lounge clothes in my opinion. This isn't necessarily a list for those looking to buy their significant other a gift, but more for the gal who just wants to get herself a fun Valentine's Day treat! I think my favorite item on this list has to be the white and red heart patterned sweater. It's classic enough that you can wear it on V-day but not too themed that you can't pull it out any other day. It comes in both white and red, and looks like it would be flattering for almost everyone. Another one of my favorites is the cozy looking Quarter Zip Fleece. It has a cute tiny heart detail and I'm a sucker for anything that looks that soft! Fleece pullovers are so trendy right now and I don't see them falling out of style, so I highly recommend this one. Will you be buying yourself a little Valentine's Day gift? What are your plans for the holiday? Oh my goodness! There are so many cute things here. You honestly can never have too many heart sweatshirts. Those heart pajamas are so adorable! I'd definitely love to have those to wear year-round. i am loving all of these adorable outfits that you picked up - these are so many adorable and cute things- i def need to grab that heart sweatshirt asap! Thank you! And I love the heart sweatshirt, perfect year round! I am loving these! I love those heart pajama short set! I need those. All of these pieces are so cute!! I LOVE that pink pullover, so cozy and cute! All of these are SO cute. I love that Valentine's day means so many pretty, feminine pieces. Ahh these are all such great V-day picks! I love that YSL lipstick! These are the CUTEST outfits/pieces for Valentine's Day! I love anything with hearts on it and I have to agree, the red and white heart sweater is my favorite!! These are the best! I love all your Valentine’s Day picks! Is it ok that I want every single item on your list? Omg! That heart shaped Le Creuset! I need it! I'm a sucker for anything red and pink! Had to Pin this to my Valentine board! I want all of it! Lovee your picks! So many fun finds here! You have found so many cute things! I've shared this to Pinterest. I would love if you added it to my Valentine's Day blog link-up. Those heart printed sweaters are so cute! Another helpful post. I am sharing Nexter Org news this blog for more news headlines. This is a very nice blog that I will definitively come back to several more times this year!